Water and sunlight grow grass. Cows eat the grass and convert it to protein. They fertilize and aerate the ground they live on, and the cycle repeats. We are humbled that nature provides the raw material that allows us to do what we do. 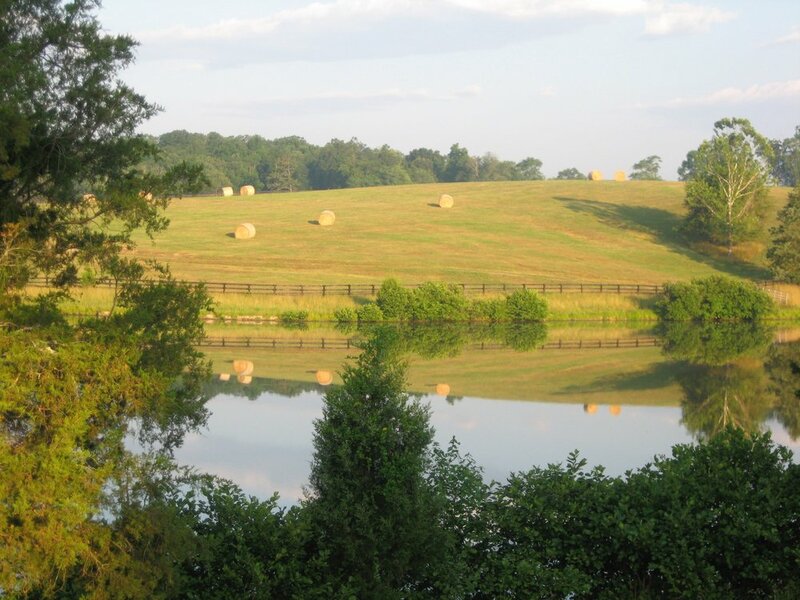 Located in the rolling foothills of Albemarle County, Sherwood Farm boasts ideal conditions for raising cattle. Our moderate climate provides ample natural grazing for much of the year as well as plentiful hay and silage grown on the farm for Winter nourishment. The original Sherwood Manor home was built in 1835 on land that was part of the original John Carter patent. It burned in 1900, but two period structures remain: a brick dependency and a rare round ice house. The current owners have placed a conservation easement on the property, ensuring it will retain its rural, agricultural character in perpetuity. Farm Manager Richard Brown, with a lifetime of experience in the cattle business, has fine-tuned the genetic profile and developed the optimum diet to produce what we now believe is the most delicious beef you can find. Judy Brown works in the office and in the field, and is the official Farm Photographer. All the pictures on this website are credited to Judy Brown Photography. Farm Owner John Lewis's grandfather was a Virginia Cattleman of the Year, John's father was a part-time attorney and farmer in Powhatan, Virginia, and John now carries the family tradition into a third generation. We have spent a decade developing a herd that produces superior beef animals: structurally sound bodies with a larger rib area and extensive marbling. Most of our females are listed in the American Angus Registry. Unlike all large industrial farms, we leave our bulls “whole,” sparing our male calves the stress of surgery. Our cows spend their days grazing lush pastures and drinking fresh well water. We finish them on a proprietary diet high in protein, fiber and the essential nutrients that produce perfectly-marbled meat. Their ration includes plenty of corn silage grown on the farm. We have built our beef program around the simple fact that happier cows make better meat. While not certified organic, we do not administer growth hormones and we treat each one of our animals with a level of care and attention that is not possible on large commercial farms.